These terms and conditions, shall apply to all Agreements between the Customer, and Westair Aviation (Pty) Ltd (including any of its Subsidiary companies), "The Company", shall supersede all estimates, statements, representations, understandings and agreements, whether oral or in writing previously entered into by the company with the customer, and shall apply to any future agreement between the Customer and the Company, whether oral or in writing. No relaxation or waiver of these conditions by the Company shall be binding on the company unless reduced to writing and signed by the Company. If one or more of these conditions is not enforceable for any reason whatsoever, the remaining conditions shall continue to be of full force and effect. A Client Acceptance and Confirmation of Quotation must be signed for each flight. Quotations issued by The Company are indicative of expected costs only and is subject to revision to accommodate and make provision for situations and fluctuations in the market beyond its control, including but not limited to foreign currency fluctuations, exchange control regulations, unexpected increases in expenditure, costs, duties and fees, or taxes, or any costs and/or expenditure incurred as a result of delays caused by the Customer or failing to provide adequate information. The Company reserves the right to change and adapt its fees and charges without notice to the Customer. Unless specified to the contrary, quotations given does not include any provision for weather related costs, access to VIP lounges and terminals, or out of normal hours airport charges which, if incurred, the Customer shall bear. Accordingly The Company shall be entitled to claim and recover from the Customer all amounts that may be due to The Company by the Customer upon completion of the flight according to The Company’s normal and usual standards and The Company shall under no circumstances whatsoever be bound by or limited to the recovery of the amount indicated in a quotation. Unless otherwise stated, all quotations are valid for 30 calendar days from date of quotation only. Quotations issued in advance are indicative only and is subject to revision based on possible fuel price, industry and government levy/fee increases. If a quotation is accepted by the customer, it must be done so in writing. For each flight a Client Acceptance and Confirmation of Quotation must be completed and signed. By signing the Client Acceptance and Confirmation of Quotation, the customer will be held liable for the account. All prices quoted shall include VAT unless otherwise stated. All services provided by The Company will be charged by The Company to the Customer at the price as expressly agreed to between them, except where additional flying was requested by the Customer or where additional flying was done to avoid bad weather, and /or to ensure the safety of the Aircraft and its occupants. 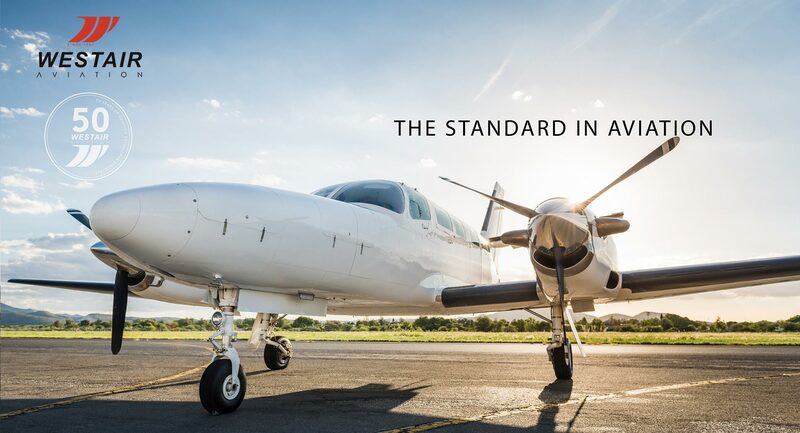 Westair Aviation accepts no responsibility for any delays or additional costs caused by unforeseen circumstances, deviations or delays due to weather conditions, safety precautions or mechanical breakdowns or any other cause whatsoever. The price is based on direct routes except where indicated otherwise. Any diversions or additional flying will therefore be charged extra to the Customer. 5.1 The Company may in its sole discretion decide to grant the customer a credit facility in terms of which payment by the customer may be made over such period, in such instalments, on such terms and subject to such rate of interest as The Company records in writing. Otherwise the transaction terms shall be deemed to be for cash payable on demand. Approval of any such credit facility shall only be binding if reduced to writing and signed by The Company. 5.2 Payment shall be made free of deduction, set-off, bank charges and/or commissions unless so agreed in writing by The Company. Direct deposits or transfers should be made into the Company's bank account or any such account as may be notified by the Company in writing from time to time. 5.3 Should an account not be paid on due date, the entire outstanding balance shall immediately become due and payable, unless otherwise arranged. 5.4 The Company shall be entitled to suspend delivery of any goods and materials, as well as suspend the delivery of any service for as long as the customer owes any money to The Company. Should costs have increased during the time of suspension, the customer shall be liable for any increased costs that arose during the period of suspension of delivery of goods, materials and/or services on resumption of delivery or performance. 5.5 The customer shall be obliged to pay on all overdue amounts interest at 2.5% per month calculated on the balance outstanding from time to time, compounded and capitalised monthly from due date for payment until actual date of payment, as well as a monthly admin fee of 2% on all overdue amounts. 5.6 The Credit Facility will be reviewed every 6 months or otherwise, if the Credit Limit needs to be extended, a new Credit Application will need to be completed for proper assessment. 5.7 The Company retains the right to, at its sole discretion, cancel or adjust the Credit Facility, at which time any amounts outstanding exceeding the Credit Limit, will become immediately due and payable. The Customer will be duly notified in writing of the decision. 5.8 It shall be the duty of the Customer to notify the Company of any change in the Customer's status or circumstances, including but not limited to, the address, both physical or registered, encumberment and/or intended alienation of the business or moveable assets other than in the ordinary course of business. Such notice must be given to the Company within 7 days of the date the Customer became aware or ought to have become aware of such changes. The Company shall not be held responsible and shall have no liability in any way arising from, in consequence of or in connection with any delay of whatever nature. Without limiting the general nature of the aforementioned, this includes liability for loss of use, income, profit or any special damages or losses as a consequence. Should a confirmed flight / booking be cancelled within 24 hours of indicated departure date and time, a cancellation fee of 20% will be charged by The Company to the Customer. The cancellation fee will bear the same terms of payment as per 5 above. In the case where payment was made before the flight, the full charter amount, less 20% will be refunded by The Company to the Customer. 8.1 The customer or his representative consents to jurisdiction of the High Court of Namibia for any legal action or proceeding The Company may institute against the customer. The Company reserves the right to, at its sole discretion, institute any such legal action under the jurisdiction of the Magistrate's Court of Namibia. 8.2 The Company shall be entitled to recover all legal expenses and all other fees and charges incurred by it with legal representatives or collection agents from the customer provided that such expenses are incurred due to default by the Customer. Save in the case of wilful misconduct and gross negligence on the part of The Company, The Company shall not be liable for any loss to the customer arising from any work carried out, services provided or goods supplied to or for the customer by The Company. All over border flights or flights into restricted areas / airfields, is subject to obtaining the necessary over flight and landing clearances. The arranging of clearances usually takes a minimum of three full working days. The Company is responsible to obtain these clearances and permits, and can only apply for the necessary clearance/s & extra insurance (if applicable) once the flight has been confirmed and paid in full, should the Customer not have Credit Facility with The Company.